Impressive. 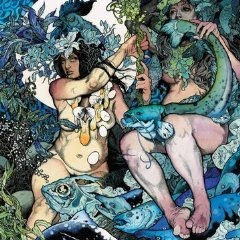 Baroness is a band that I have had my doubts about. I picked up their "Red Album" and I was not impressed. And now their latest release "Blue Record" is out, and I'm been considering picking it up for a while now due to rave reviews. After hearing "A Horse Called Golgotha", I know I need to get this album right away. Frightening and catchy prog/punk...somewhere between Mastadon and Fugazi. Check it out. Amazing video as well. Labels: A HOrse Called Golgotha, Baroness, Blue Record, Fugazi, Mastadon, Red Album.